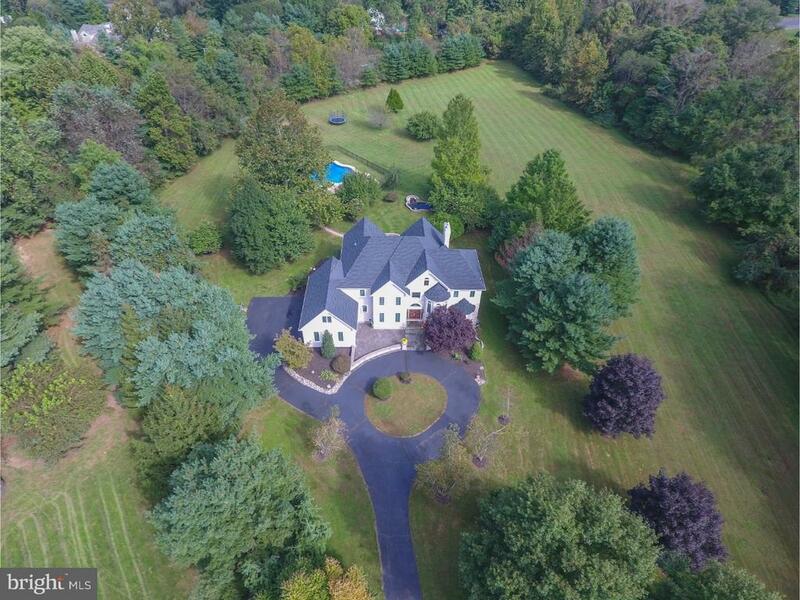 Introducing this magnificent zaveta custom built estate property in solebury township! Located just minutes from downtown new hope, this updated, custom built and professionally designed home is located in the sought-after neighborhood of kingswoods ridge, nestled on 2. 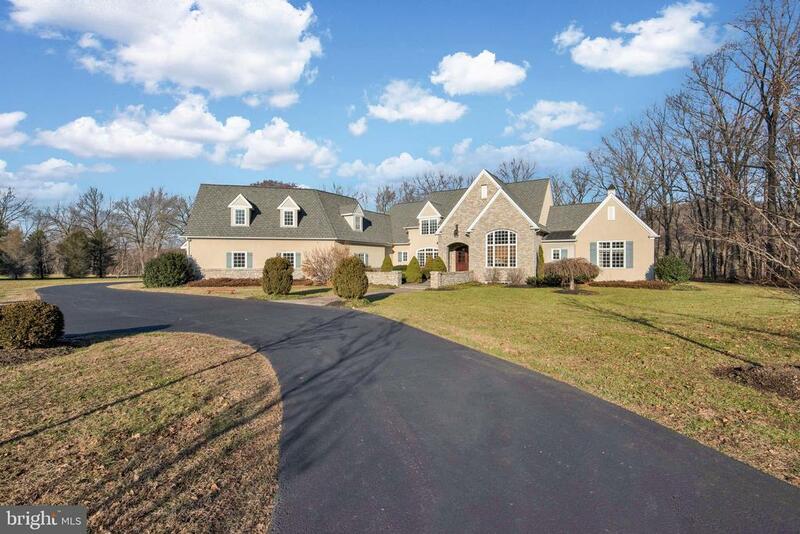 77 acres on a cul-de-sac with belgian block curbs, 9+ foot ceilings, and custom mill work throughout the home. The attention to detail is like no other. The home is beautifully landscaped with rock walls, mature specimen trees, gorgeous manicured gardens, sprinkler system throughout the yard, a deer fence, lighting, and speakers in the back yard and decks for outdoor entertaining by the pool and hot tub. The experience begins upon entering the main two-story foyer, flanked by a formal dining room and study. Ahead is the gorgeous step-up 2 story living room, with floor-to-ceiling windows and a deck overlooking the exquisite grounds. The main floor also boasts two powder rooms, and a breathtaking sun room, providing amazing vistas of the property. The kitchen, updated with a recent $150,000 remodel, features a wolf range, two miele dishwashers, a built in kitchenaid side-by-side refrigerator. Cooking and entertaining will be a dream in the large eat in kitchen, featuring two islands and ample seating at the breakfast island. The family room features custom built-ins and a stone, wood burning fireplace. Located off the family room is a large deck, providing spacious areas for lounge seating and dining, while enjoying views of the gardens and stunning pool. This deck provides cover for an outdoor dining area below. The upstairs is home to a master suite, recently updated with an extensive remodel. A soaking tub, overlooking the gardens, is the focal point of the master bathroom, surrounded by his and her vanities, and a heated toilet with built in bidet. The master suite also features a walk-in dressing room, complete with custom built-ins and a drawered island. The closets in each bedroom have been custom designed. The upstairs experience continues with a junior suite, complete with a newly renovated bathroom, and a jack & jill bedroom and bathroom. The home features a walk-out basement, complete with wet bar, a fifth bedroom and full bathroom. The basement has been beautifully finished with a media area (complete with projection screen), a second home office, a wine cellar, and ample storage. This zaveta built french inspired, custom home has been masterfully maintained and is full of classic & elegant details. A lovely 2 story entry with exquisite custom molding, millwork and transoms opens the office with french doors to the left and a beautiful formal dining room with built-in cabinets to the right. Continue to the heart of the home where the living room blends into the step down family room with gas fireplace, built in cabinetry (that has plumbing for a wet bar) and a wall of windows which natural light flows throughout. The gourmet kitchen contains a breakfast area with door to the back bluestone patio, granite counters, custom tile backsplash, high end appliances, warming drawer, eat-in island and cherry cabinets. The finished lower walk out level is a comfortable and relaxing area for entertaining and enjoyment with a billiard area, fireplace and lounge area, built-in bar, theater room, full bath, wine closet and ample storage. The master suite offers a gas fireplace, luxurious bath with soaking tub and extended tiled shower and an enormous walk-in closet full of built-ins. Additionally on the 2nd floor is a princess suite with private bath and bonus room and 2 other bedrooms sharing the hall bath. Other highlights include; beautiful hardwood floors, raised panel wainscoting, custom windows, laundry/mud room, high ceilings, tray ceilings, central vac and built in speakers. 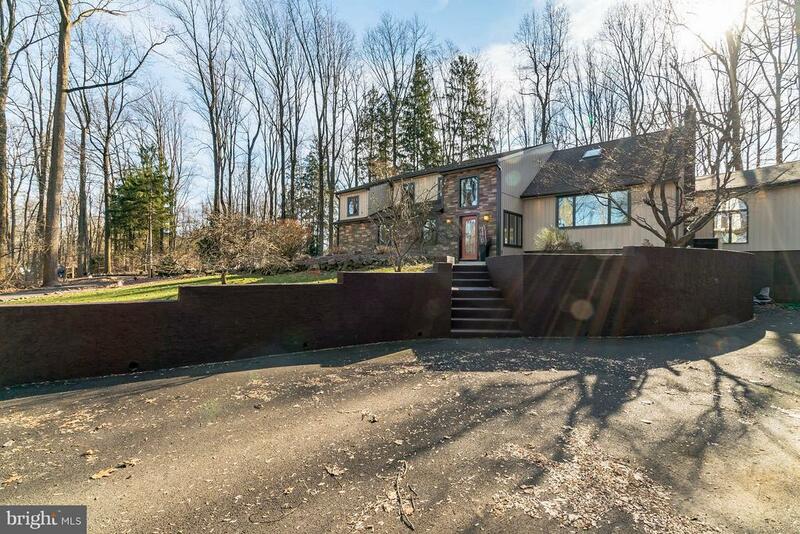 This home is located on a beautiful cul de sac street in laurel brook with over an acre of land that has lush professional landscaping, patios, a deck and gardens. Not your cookie cutter home! Come see for yourself! This unique 4 bedroom, 3. 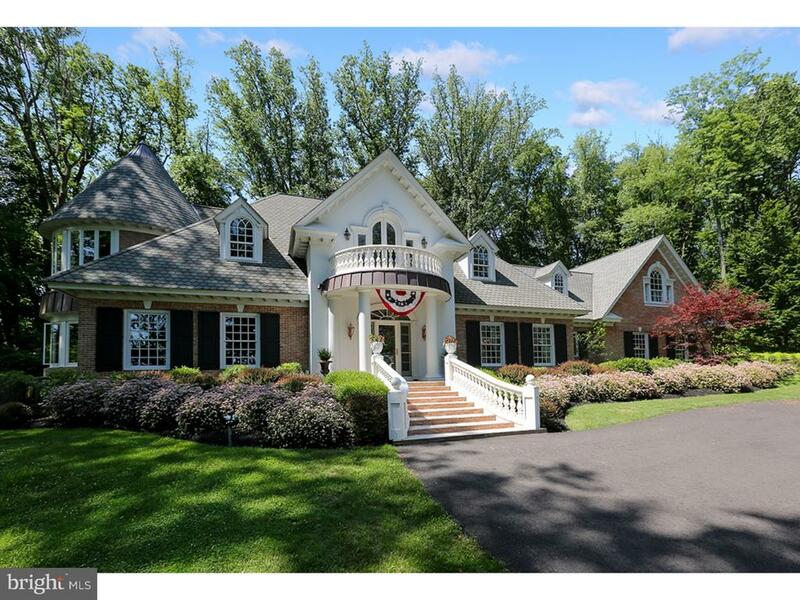 5 bath newly renovated estate sits high on solebury mountain in a private wooded setting at the end of a cul-de-sac. You have the best of both worlds with this location: a lush country setting only a stone?s throw from the new hope boro and all major highways. 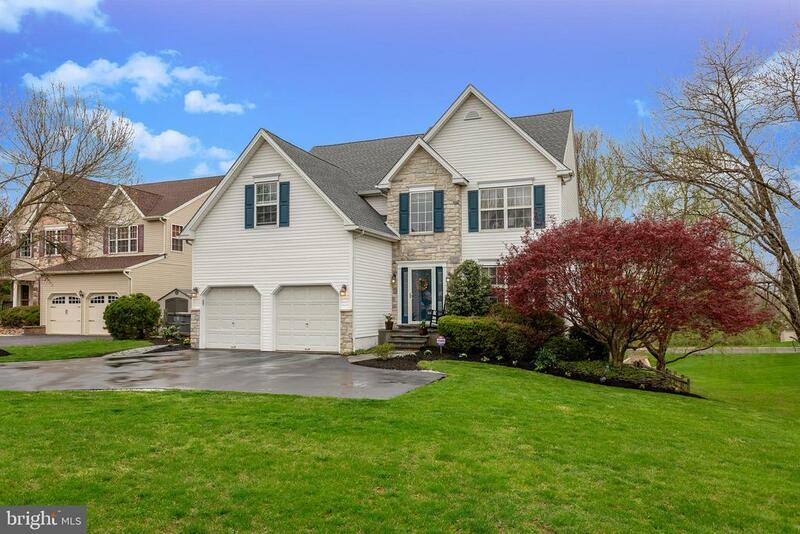 This exquisite home centers around the large entertaining room with wet bar, dining room, and center island kitchen, all which flow into a sunlit morning room overlooking your own nature preserve, surrounded by trees and bucks county wildlife. A separate family room with wood-burning fireplace accesses the exterior & pool. This exterior boasts a great entertaining area around your heated in-ground pool and professional landscaping well maintained throughout the seasons. Plenty of parking and garages for your car enthusiasts. Some of the recent upgrades include: brand new boiler in 2019; all new windows and doors, newly upgraded chef's kitchen and dining room with custom cabinets, granite, and the open floor plan to entertain throughout the home. Close to all major highways and centrally located between philadelphia and new york city this elegant contemporary home offers unparalleled craftsmanship and exceptional amenities! Motivated sellers! Lets make a deal! Riverwoods is one of new hope~s most popular neighborhoods, within walking distance to town but also far enough from main street to provide a sense of calm. This spacious, 4-bedroom home is ideally situated in riverwoods at the end of a cul-de-sac and on one of the biggest lots available. The residence itself has an impressive 18-foot foyer anchoring a classical floor plan. Much of the home~s flooring was recently redone and is now engineered and durable wood. Formal rooms, including a dining room and sitting room, are convenient to the upgraded, open and airy kitchen and the casual, comfortable family room. The kitchen was given a major refresh in 2017 with new wood cabinets and glass-front doors, new granite countertops and a new backsplash. The kitchen is open to the family room where a beautiful fireplace adds ambiance and warmth on chilly nights. A sliding door opens to a large deck overlooking lots of open space and trees. Upstairs is the master bedroom suite with a cathedral ceiling, a large sitting area/office/nursery, a walk-in closet and full bath. The other 3 bedrooms share a hall bath. As a bonus, the walkout, daylight lower level is finished and offers a full bar, a large finished room currently used as a media room and an additional room with adjoining closet that could easily accommodate overnight guests, an office or hobby room. More updates were recently done on the mechanicals, including the installation of a generac whole-house generator, high-efficiency heater and ac and 50-gallon hot water heater in 2016, as well as a new roof with 25-year shingles. Walk or bike to the historic riverfront towns of new hope and lambertville and hop on the canal path or stay in town and enjoy an abundance of restaurants, theater and live music, shopping and sightseeing. Location, location! 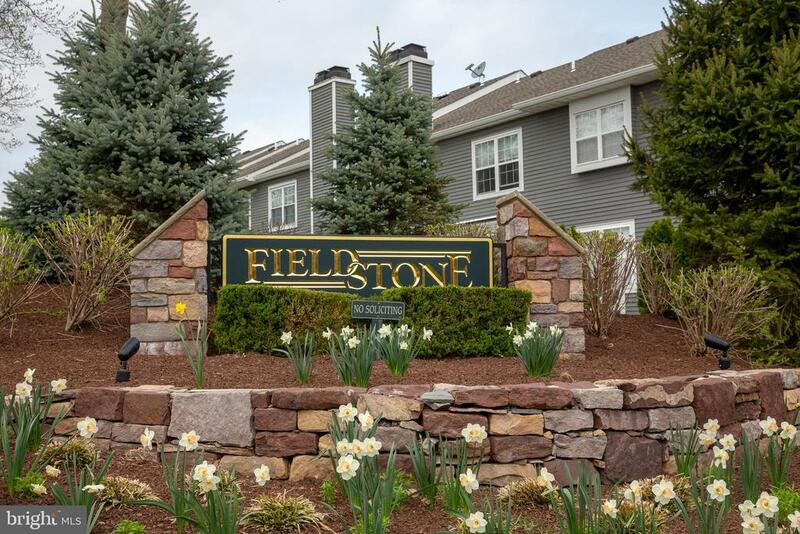 If you are looking for a private setting, this lovely townhouse in fieldstone is positioned perfectly, backing up to a mature & beautifully landscaped area creating a buffer of privacy. 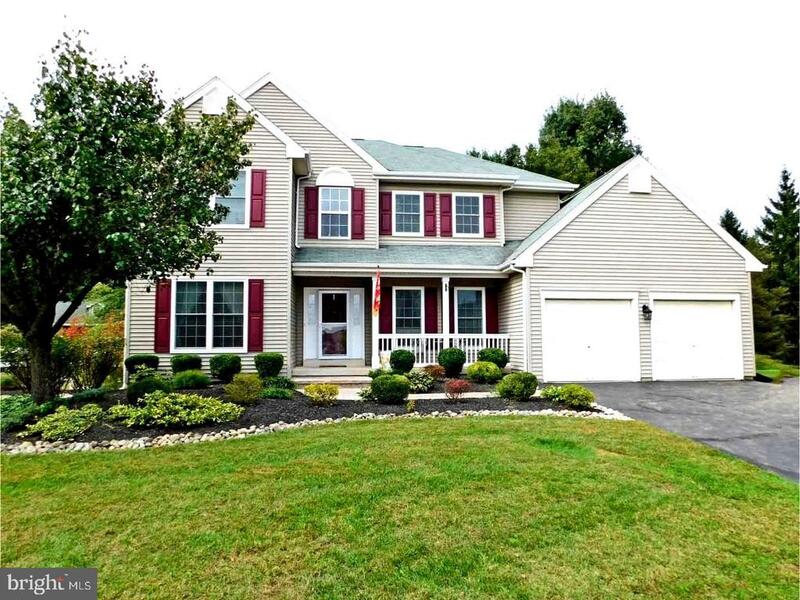 Enter into a 2 story foyer and enjoy the open floor plan. The kitchen with all stainless steel appliances opens up to the great room with polished wood floors and a wood burning fireplace. Three spacious bedrooms, walk-in closets, an extra cedar closet and 2 full baths complete the 2nd story. There is a full basement with some shelving great for storage for those who may be downsizing. Freshly painted and ready to go!.